In 2008 Attorneys Peter Wolff and Ron Sonderhouse combined their 30 years of legal experience and formed the partnership of what is now well known as Wolff & Sonderhouse, LLP. 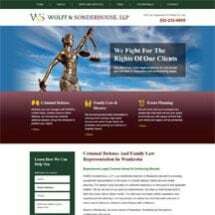 Since then Wolff & Sonderhouse has become a well known firm in Waukesha County and surrounding areas. The firm specializes in litigation with a focus in criminal defense and family law. In 2012 Attorney Chelsea Williamson was added, assisting in our family and criminal defense caseload. In 2015 the firm expanded to include Attorney Zach Hoff whose interest is civil law, including small claims and employment law. The attorneys at Wolff & Sonderhouse, LLP are heavily involved in the local community, ranging from the Waukesha County Bar Association (as members and President elect), the Waukesha County Fair Board, President Elect of the Waukesha District of Kiwanis International. Waukesha County Board of Supervisors, the President of the Juvenile 180 Diversion Program, member of the Waukesha County Facility and Security Committee, Chairman of Judiciary and Law Enforcement Committee, volunteer mediator with the Mediation Restorative Justice Center, Co-Chair of the Waukesha County Juvenile Law Section. Co-Chair of the Waukesha County Young Lawyers Division, member of the Junior League of Milwaukee. Volunteer Judges in Waukesha and New Berlin Teen Courts, and a World Trivia Champion. Wolff & Sonderhouse, LLP focuses on getting each of our client's the best outcome in their specific case, whether that is acheived through a litigated trial negotiation with opposing counsel, or participation in alternative courts for a reduction in sentence.